Laser hair removal treatment is an effective and non-invasive medical procedure to remove unwanted hair from the face, underarm, arm, chest, back, bikini area and legs. Patients describe the treatment as gentle heat or the sensation of snapping rubber band. Cooling gel is used to provide further comfort. Depending on the area of treatment, each treatment session takes between 10 to 30 minutes per session and treatment interval ranges between 4-6 weeks depending on the area, as different parts of the body have different hair growth cycle. The devices used at Alainn are USA FDA-Cleared. 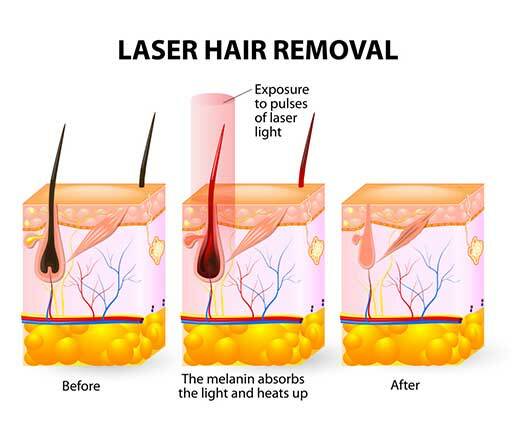 Lasers can selectively target the pigments surrounding hair follicle only whilst leaving the surrounding skin undamaged. Hair reduction can be seen after a month or two into the sessions depending on individuals. Laser’s efficacy provides better benefits compared to other methods. The initial investment outweighs the effort, time and money saved in the long run. Generally, patients will achieve results in 6-8 sessions within a year. The targeted hair follicles will not regrow.